Just like us ours pets can suffer from the cold weather and below are some tips on how to keep your pets safe this winter! A warm vehicle engine can be appealing to a cat as a warm place to sleep. Before starting your car, you can honk your horn to encourage any cat to abandon the car engine. This can help prevent accidental injury to feline companions. While your four-legged friends are out in the cold be sure that they are protected from the harsh winds and cold temperatures. 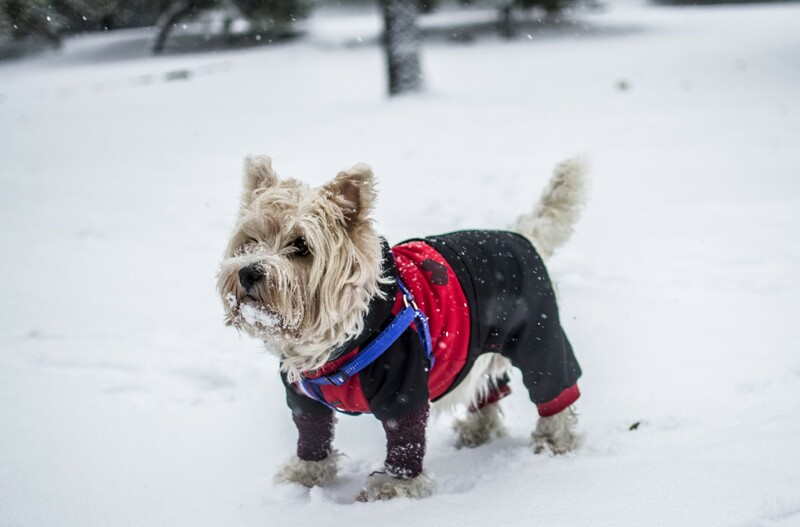 If your pet will wear a sweater or jacket this can help keep them warm while outside. Making sure they have a warm place to get out of the cold is also highly recommended. Cold weather can be hard on pets with arthritis. If your pet is suffering from any stiffness or seems to be slowing as the weather is changing you may need to talk with your veterinarian for options to help manage the arthritis in your loved ones. The cold weather is not the only thing about winter that can be harmful to your pets. With the holidays upon us there will be lots of goodies that our pets would love to get into that can be harmful to such as chocolates and cookies. As tempting as it may be give your pet a piece of the holiday ham or turkey, is not a good diet choice for your four-legged friend and can increase their risk for pancreatitis. Christmas tree decorations can also be harmful to pets. Keeping ornaments and tinsel out of reach of pets so they are not tempted to taste or eat them is advised. To a cat tinsel can be very tempting to play with but can lead to a linear obstruction if swallowed. A shinny ornament can seem appetizing to your dog and lead to esophageal or intestinal obstruction. We wish you, your family, and pets a very Merry Christmas!